The trek to Dzongri peak is a classic Sikkim trekking opportunity. 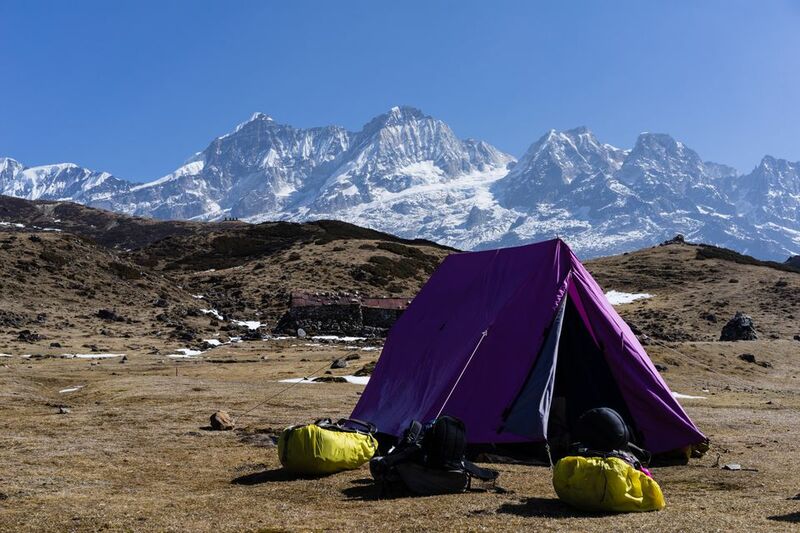 It starts at Yuksom and passes through the dense tropical forest of Khangchendzonga National Park (also known as Kangchenjunga/Kanchenjunga National Park). Magnificent views of towering mountain peaks, rhododendron forests, and the river flowing down in the valley add to its charm. Look through these Dzongi peak trek photos, and read the accompanying guide to trekking to Dzongri Peak, to experience the mesmerizing natural beauty of this area. This map, outside the entrance to Kanchendzonga National Park, shows the route. Yuksom is a small village in Sikkim with a population of about 150. It sits on the edge of Khangchendzonga National Park. Buddhist flags flutter in the wind at Yuksom, along the road leading to the start of the trekking trail. Yuksom is surrounded by picturesque forest and the first five or so miles of the trek are quite easy. However, the trail ascends steeply after crossing the Prek Chu River, and it's strenuous two to three hour uphill hike to Bakhim from there. Bakhim offers stunning views of the Yuksom Valley and mountain peaks on a clear day. There's a stall at Bakhim that provides snacks and tea. Some people choose to stay the night at the Forest Rest House. However, most continue on to Tshoka (another hour away). This remote Tibetan settlement has just a few families who maintain the area and facilities for trekkers. There's a camping ground, trekker's hut with space for about 20 people, and a Forest Rest House. Plus, cafe that sells local malt beer. It's a good idea to spend a day acclimatizing at Tshoka to avoid any altitude sickness later on. Tshoka to Dzongri is a tough stretch, involving a climb from about 9700 feet to 13,000 feet. It's a steep incline, and you'll definitely be feeling the altitude! Tshoka has a peaceful little Buddhist monastery that's worth a quick visit. The trail from Tshoka to Phedang is well defined, and a large part of it is paved with wooden slats. Strong and study dzos, which are half cow and half yak, are used to haul trekker's equipment up the mountain. The log path turns into a rocky trail before Phetang and you may encounter traces of snow. The snow may even cover the trail. If it sets in, the snow can really make trekking difficult. The trek passes through magnificent rhododendron forests, starting off with white and red flowers and progressing to a deeper color below Dzongri. Trekkers usually reach Phedang by lunchtime and stop to eat there. This midway point is on a ridge 12,000 feet above sea level. The steep climb continues for about an hour from Phedang, and then becomes easier until Deorali Top (the highest point in the area). From Deorali it takes under 30 mins to reach Dzongri, at 13,000 feet. The snow starts to get heavier towards Dzongri. If conditions are bad, it will cover the Trekker's Hut in Dzongri, and strong winds may threaten to blow it away. There's also a campsite near the Trekker's Hut at Dzongri. If the weather is clear, it has a spectacular panoramic view. Many people choose to get up before dawn, and trek about an hour to the summit at Dzongri Peak to catch a magical sunrise there. Unfortunately, inclement weather does obscure the view and often prevent trekkers from reaching the summit. The top of Dzongri Peak is about 13,600 feet above sea level. The view across Kanchenjunga, the third highest mountain range in the world, is simply awe-inspiring and totally worth the trek!